After it launched into space in 2009, NASA’s Kepler Space Telescope sniffed out thousands of potential planets around other stars, simply by watching for the dips in starlight as planets pass over — transit — the disc of their stars. Among Kepler's portfolio of planets are gas giants like Jupiter, but many of these are so close to their stars that their atmospheres sizzle at over 1,000 degrees. Others are Neptune-sized, or smaller "super-Earths" lurking in their stars’ habitable zones. While the mission may have seen more stars in this area of sky, some of the stars and their transits that Kepler observed are so faint that ground-based telescopes can’t conduct follow-up observations. What’s needed is a telescope, or a set of telescopes, that can look for planetary transits of the closest and brightest stars across a much wider area of sky, researchers say. Enter the Next-Generation Transit Survey (NGTS). It's the successor to the highly successful Super-WASP project, which was assembled on a shoestring budget and sports two observatories in the Canary Islands and South Africa. NGTS is being built atop Cerro Paranal at the European Southern Observatory (ESO) in Chile’s Atacama Desert. It will be the perfect counterpoint to the space-based Kepler, advocates say. "We have the Kepler machine that has found over 2,000 planet [candidates], which is wonderful," said Didier Queloz, an exoplanet expert who recently joined the University of Cambridge as Professor of Physics at the Cavendish Laboratory. "Most of them are Neptune-sized, but the problem is that all these planets are so faint that we cannot measure their mass or do anything about them." Researchers know that these planets are there but, without the necessary instrumentation, there is not much they can do in the way of truly understanding what they and their atmospheres are made of. "For scientists, it is a lot of frustration because in that sense Kepler is an experiment that brought even bigger questions," Queloz said. NGTS’ job is to find planets around bright or nearby stars for which these questions can be solved. It is not interested in any old planets, but instead mostly the smaller "hot Neptunes" and any super-Earths that if finds. "This will be the first statistical sample of measured densities for small planets," said the University of Warwick’s Peter Wheatley, who is NGTS’ co-principal investigator. "We believe this sample will allow quantitative tests of planet formation, migration and evolutionary models, and will drive the development of future models." The NGTS team doesn’t plan to stop there. They are thinking even more ambitiously, with the intent of finding super-Earths and Neptunes around stars bright enough for large telescopes — such as Hubble, the Very Large Telescope or the James Webb Space Telescope — to characterize their atmospheres using transmission spectroscopy. This method studies the starlight that is absorbed as it passes through the thin atmospheric veils that coat these worlds. Mikko Tuomi of the University of Hertfordshire in the United Kingdon, who is not a member of the NGTS consortium, said that its findings will be valuable. In its hunt for super-Earths and hot Neptunes, the Next-Generation Transit Survey will cover more of the sky than NASA's Kepler space telescope did. "It [NGTS] will likely produce several dozen new detections, which is good because it helps us understand the formation processes and the occurrence rate of Neptune-sized planets better," he said. "Plenty of the candidates that they will find will also have radial velocity follow-ups, which is another good thing as it allows for independent confirmation and, more interestingly, simultaneous determination of planetary radii and masses, which can then be used to estimate planet compositions." As far as detecting planets in the habitable zone, Wheatley doesn’t rule it out, although he admits it’s not one of NGTS’ primary goals (unlike Kepler). "It is actually possible that we will find planets in the habitable zone around red dwarf stars," he said. "Our simulations show we should be sensitive to two or three habitable zone planets, but we’re not making them one of our primary science goals as they are right at our detection limits." Of course, whether life could exist on a Neptune planet, be it hot or cold, is uncertain, particularly as scientists don’t yet fully understand the make-up of hot Neptunes. Furthermore, could the telescope array discover something smaller than a hot Neptune? "We hope to detect perhaps 20 super-Earths around stars brighter than 13th magnitude as well as 60 or more hot Neptunes," said NGTS team member Matt Burleigh of the University of Leicester. "The super-Earths will most likely be found around the smaller radius, lower mass red dwarf stars in the survey area. Some could even be in their host star’s habitable zones, which are much closer to red dwarfs than solar-type stars." In comparison to the Kepler spacecraft, NGTS’ advantage is its total survey area of 100 square degrees, scientists say. "The field of view of NGTS is similar to that of Kepler, but we are planning to observe around four fields per year for at least four years and so we should cover at least sixteen times the sky area that Kepler does," said Wheatley. NGTS’ predecessor, Super-WASP (Wide Angle Search for Planets), has detected 65 exoplanets since it went online in 2004. SuperWASP doesn’t have any telescopes to its name, but rather just arrays of camera lenses bought from eBay. So NGTS, with its custom-built 8-inch (20 centimeters) aperture telescopes, each affixed to its own individual mount and each sporting a large format CCD camera, is a big step up. But it's still dwarfed by its giant neighbors, the four 8-meter telescopes of ESO's Very Large Telescope, which NGTS will sit next to atop the peak of Cerro Paranal. 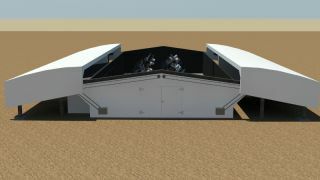 (NGTS is the first private instrument to be granted permission to build at the ESO site at Cerro Paranal). Currently being assembled for just less than two million pounds (around $3 million) NGTS will see first light in 2014. SuperWASP allowed many scientists like Wheatley and Burleigh to cut their teeth on exoplanet detection, so that when it comes to NGTS they’ll be able to dive straight in. NGTS is coming along at the vanguard of a new wave of planet-detecting instruments. For example, ESPRESSO, the Echelle SPectrograph or Rocky Exoplanet and Stable Spectroscopic Observations, is to be the successor to the HARPS (High Accuracy Radial velocity Planet Searcher) spectrograph, which holds the record for the most exoplanet discoveries from a ground-based instrument, and will be attached to the VLT to make sensitive radial velocity measurements. Then there's TESS, NASA’s Transiting Exoplanet Survey Satellite, which will perform similar work as NGTS, searching the nearest or brightest stars for transits. Meanwhile, the European Space Agency’s CHEOPS (CHaracterising ExOPlanets Satellite), which like TESS is slated to launch in 2017, will target previously confirmed planets in order to improve the measurements of these transits that have been uncovered from Earth. NGTS will be able to provide planet fodder for all of these missions and instruments to investigate further, in conjunction with the likes of the James Webb Space Telescope or the European Extremely Large Telescope (E-ELT). "To confirm our planets and measure their mass and density, we require sensitive radial velocity measurements, initially with HARPS and then also with ESPRESSO on the VLT," Wheatley said. "And to detect the atmospheres of NGTS planets, we need a wide range of VLT and eventually E-ELT instrumentation for transmission spectroscopy and secondary eclipse observations. So we need ESO facilities to achieve our science goals, and ESO needs NGTS to provide small planet targets to the VLT and eventually E-ELT."